A firm “no nonsense” message from Indian Prime minister Manmohan Singh has been conveyed to Sri Lankan President Mahinda Rajapaksa by Indian national security adviser Shiv Shankar Menon during his breakfast meeting with the Sri Lankan head of state on Tuesday July 9th 2013. According to informed Indian sources the message from Manmohan Singh had indicated that New Delhi expected President Rajapaksa to implement pledges made to India and the International community about implementing the Thirteenth Amendment to the Sri Lankan Constitution and also go beyond its framework to provide enhanced meaningful devolution to the existing Provincial Councils scheme. If Sri Lanka failed to honour these pledges and attempted to diminish the scale and scope of Devolution currently available through Provincial Councils then India would be constrained from extending support to its Island neighbour when faced with pressures and problems in the International arena-This was the crux of the message from Manmohan Singh. Although the discussions between the Lankan president and Indian national security adviser had been as cordial as ever the message from the Indian Prime minister was delivered in a very direct and explicit manner without being couched in diplomatic jargon revealed informed sources. According to Indian sources the usually affable and soft Manmohan Singh has been uncharacteristically ruffled by what the Indian premier perceives as “bad faith” by President Rajapaksa. Apparently President Rajapaksa has on three separate discussions with Prime minister Manmohan Singh in the past committed himself unambiguously to implementing the 13th amendment in full and also go beyond its present parameters to provide greater devolution. It was President Rajapaksa himself who had used the phrase “13 Amendment Plus”to denote his willingness to go beond the present framework of Provincial Councils and provide maximum devolution possible,pointed out these sources. President Rajapaksa had reiterated these sentiments to other Indian dignitaries such as former External Affairs Minister SM Krishna and Opposition leader Sushma Swaraj. Furthermore Sri Lankan cabinet ministers like Prof.GL Peiris and Mahinda Samarasinghe had also assured India and the International Community about President Rajapaksa’s bona fides in this regard. Moreover President Rajapaksa had also assured UN Secretary-general Ban Ki Moon that he intended to arrive at a political settlement aimed at achieving ethnic reconciliation. Given this context,recent moves by President Rajapaksa to amend the 13th amendment and dilute available devolution had irritated the Indian establishment in general and annoyed Manmohan Singh in particular. The Indian Prime minister who had earlier evinced great confidence in the Political integrity of President Rajapaksa had been upset at what was seen as a breach of solemn pledges. It is against this backdrop that Manmohan Singh’s special message on behalf of the Indian Govt was conveyed to Mahinda Rajapaksa by SS Menon. It was pointed out that India had been of tremendous assistance to Sri Lanka in coping with severe international pressures on many fronts in recent times.It was India that helped dilute the resolution initiated by the USA on Sri Lanka at the UN Human Rights Council in Geneva.It was India that helped ensure Sri Lanka’s status as hosts of the Commonwealth heads of state summit to be held in the Island in November. 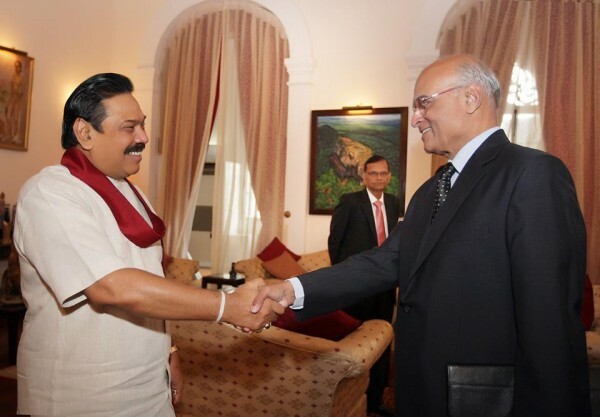 It was stated that India was advocating Sri Lanka’s case Internationally on the basis that President Rajapaksa was genuinely committed to ethnic reconciliation and political harmony through a viable scheme of devolution. But if President Rajapaksa wavered or vacillated on that commitment then India would not be in a position to espouse Sri Lanka’s case in its interaction with the International community.New Delhi would be reluctantly compelled to maintain a “hands off”policy when Sri Lanka faces “pressures and problems”from the world at large.Therefore India hopes that Sri Lanka would honour its commitments on Devolution and not push India into adopting an aloof stance vis a vis Sri Lanka. It was emphasised that India had the best interests of its Island neighbour and friend at heart and was always prepared to help resolve its predicament in the sphere of ethnic relations. President Rajapaksa responded by outlining the problems he faced in implementing some of the powers allocated to Provincial councils in areas such as Police and lands and also stated that the question of provincial council powers can be resolved through the mechanism of a Parliamentary Select Committee(PSC). It was also outlined to President Rajapaksa that with or without the TNA the situation at present was one where the PSC seemed to lack representation from all stakeholders. Apart from the TNA, the United National Party(UNP),Sri Lanka Muslim Congress(SLMC) and Janatha Vimukthi Peramuna(JVP)were also out of the PSC. Also some key ministers in the Govt too were not included. It was suggested that the Sri Lankan Govt should not act with haste in trying to bring about changes in devolution. Such changes should be multilateral with the consensus of all stake holders and not be perceived as an unilateral exercise. India expressed its satisfaction and appreciation over the fact that President Rajapaksa was going ahead with his avowed intention of holding elections to the Northern Provincial Council. Shiv Shankar Menon also said the Northern Provincial polls was eagerly anticipated globally and it was imperative that the elections should be free and fair. It was also stated that India would do its best to prevent its fishermen from straying into Sri Lankan waters.It was however said that the issue should be viewed as a humane issue. Fishermen could be arrested and treated according to law but steps should be taken to avoid physical hurt and harm befalling them. Informed sources said that Manmohan Singhs message about potential Indian “inaction” in future was predicated on the course Sri Lanka would take in the coming days.”The message has been conveyed and we hope there would be a positive response”said the sources. “National Security Adviser Shivshankar Menon — who met top Sri Lanka leaders here in the last two days — emphasised the need for Colombo to fulfil its commitment to India and the international community regarding a political settlement that would go beyond the 13th Amendment of the country’s Constitution. The amendment introduced provincial councils with specified powers based on the provisions of the Indo-Sri Lanka Accord of 1987. Mr. Menon — here for trilateral talks with Sri Lanka and the Maldives on maritime security — also held bilateral meetings with Mr. Mahinda Rajapaksa, Defence Secretary Gotabhaya Rajapaksa and Economic Development Minister Basil Rajapaksa on recent political developments. During his visit, the National Security Adviser called on H. E. the President of Sri Lanka and also held bilateral meetings with Minister for Economic Development Mr. Basil Rajapaksa and Defence Secretary Mr. Gotabaya Rajapaksa of Sri Lanka. In these meetings, both sides reviewed the progress in bilateral cooperation and exchanged views on areas of common concern. They expressed satisfaction on the progress in implementation of the Indian-assisted projects for relief, rehabilitation and resettlement of IDPs, including the Housing Project, as well as projects relating to the development of railway infrastructure in the Northern and Southern Provinces. They also discussed the fishermen issue and agreed on the need to deal with it in a humane manner without resorting to violence under any circumstances. They agreed that fishermen’s associations on both sides, which had met in the past and reached some understandings, needed to meet again to work on developing this further. This could then serve as the basis for finding a solution to this humanitarian issue. The National Security Adviser conveyed to the Sri Lankan leadership the Government of India’s views on the recent political developments and called for early political settlement and national reconciliation through the meaningful devolution of power so to ensure that all citizens of Sri Lanka, including the Sri Lankan Tamil community, would lead a life marked by equality, justice, dignity and self-respect. In this context, he also emphasized the need for adhering to the commitments made by the Sri Lankan Government to India and the International Community on a political settlement in Sri Lanka that would go beyond the 13th Amendment. He also expressed the hope that elections to the Northern Provincial Council would be held in a free, fair and credible manner. « Can Bodu Bala Sena and Jathika Hela Urumaya Protect and Safeguard Sanchi,Ajanta,Kapilawastu and Lumbini in India and Nepal?